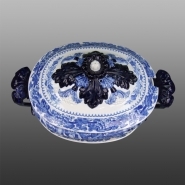 Shown here is a view of the tureen cover. 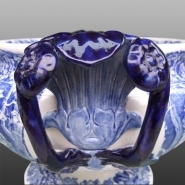 A close up view of the skillfully molded tureen handles. An earthenware soup tureen, cover and stand with molded embellishments printed in the Winemakers pattern . The molded handles and the finial are painted in a deep cobalt blue ground.